Silly or not, that belt buckle is the only personal safety device that passengers receive on most aircraft. An increasing number of carriers have transitioned (or are transitioning) to airbag-equipped seat-belts but full airbags in airline cabins have yet to be widely implemented. That doesn’t mean that designers haven’t considered it; German airline seat manufacturer Recaro has recently filed a patent for an airbag that would be installed in the first or business class cabins. 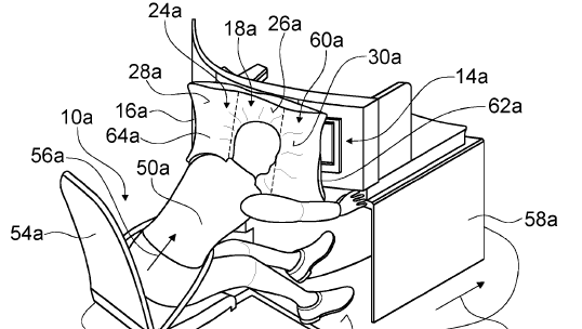 Recaro’s patent illustrations show that, in the event of a crash, the airbag would deploy from a compartment beside the in-flight entertainment screen. 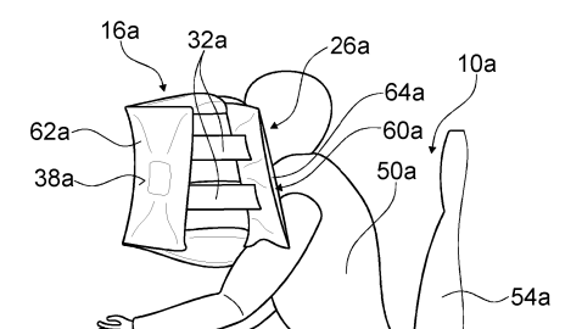 The airbag would inflate in two separate zones, with the first providing immediate impact protection for the passenger’s head, and the second inflating to cushion the passenger’s shoulders. Recaro has not linked its patent to any particular carrier but, but the firm designs and constructs seats for dozens of different airline customers around the globe. If those airbags are ever implemented in premium cabins, we look forward to hearing about them in the safety lecture. Just make sure you fasten your seat-belt too. Jelisa Castrodale is contributor to USA TODAY’s Road Warrior Voices and her posts are occasionally used in Ben Mutzabaugh’s Today in the Sky blog. The Foreign Office is warning travellers to France that journeys by air, rail and sea are likely to be affected due to a strike by transport workers today. Airlines have been told the cancel 20% of flights from Paris Orly and a third of flights from Marseille airports as air traffic controllers are staging a 36-hour walkout. At Paris Charles de Gaulle, flights are more likely to be affected by delays than cancellations. However, the strike is also hitting flights to other European destinations that pass over French airspace. Ryanair has cancelled around 80 flights across Europe, including more than a dozen from the UK to France, Spain and Italy. British Airways said it had cancelled an unspecified number of flights to and from France but warned that other European flights which use French airspace will be affected and passengers should be prepared for delays and cancellations. “We will be using larger aircraft, where possible, to help affected customers and are doing all we can to reduce the levels of disruption'” said the airline. EasyJet has cancelled a number of flights and it is warning passengers who are still due to travel that public transport in France will also be affected. In a statement on its website, the airline added: “We are disappointed at this unnecessary strike action, coming so close to the ATC strikes of last week, and causing further disruption for passengers and airlines across Europe. “As a member of Airlines for Europe (A4E), we are working with other airlines including Air France KLM, Finnair, International Airlines Group (IAG), Lufthansa Group, Norwegian and Ryanair, to call on governments and the EU to develop an action plan to minimise the impact of ATC strikes on passengers. “We are doing everything possible to minimise the impact of the strike on our customers, and have taken the decision to proactively cancel a number of flights, allowing customers to reorganise their journeys. We will communicate to affected customers directly via SMS using the details provided at the time of booking. “For cancelled flights, any affected customers will be offered a free of charge transfer to a new flight or a full refund. We strongly advise customers to avoid rebooking flights on the same day, as there is the possibility of further disruption. Eurostar services to Paris and Lille appear to be operating as normal, but a quarter of Metro train services in Paris have been cancelled and only half of all commuter trains are operating. TGV high speed and regional trains have also been affected. In Paris, the Eiffel Tower is closed, according to The Local website, as workers have joined the strike. When will the French learn that they are doing irreparable harm to their country? Seven minutes. That’s how long it takes to microwave a small frozen pizza. It’s the length ofLed Zeppelin’s No Quarter, give or take a second. And it’s also the maximum amount of time that the majority of hotel guests can go without connecting to Wi-Fi. Yes, according to the study, hotel guests said that they most frequently used the Wi-Fi to check the weather in their location. A quarter of respondents said that they ignored the television and used the Wi-Fi to watch Netflix, Amazon Prime or other streaming services. Those surveyed also listed Wi-Fi as the second item on their wish lists, right behind getting a free room upgrade. But Wi-Fi outranked having a room with a view (if you’re staring at the lush landscapes of Downton Abbey, who cares what’s outside your window?). That data echoes what TripAdvisor discovered in its own recent TripBarometer survey of more than 44,000 travelers and hoteliers. According to that research, 46% said that in-room Wi-Fi was a “must have” amenity and that they would look for alternate accommodations if it was not available. More than a quarter (26%) specified that they required super fast Wi-Fi in their hotels. Guests who responded to the Roomzzz survey overwhelmingly (61%) said that they felt “bored, lonely and cut off from the real world” if they couldn’t get online, while 10% said that they would go into an all-out panic without an internet connection. But a sliver of those surveyed (10%) said that they would be “relieved” if their hotel did not offer in-room Wi-Fi. Tourist spent 5.5 billion dollars in 2014 on Long Island. One in ten jobs is directly related to tourism. as well as the many things to do and see right here in our own back yard! There will soon be a new option for some fliers looking to book flights in the West. JetSuite, a California-based private jet charter company, will try its hand at scheduled passenger service on select western routes. 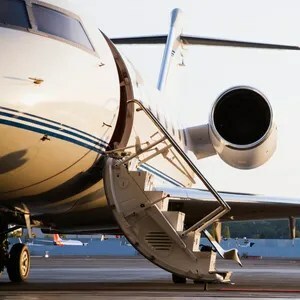 The company promises passengers buying tickets on those flights will get a “private jet experience.” Flights begin April 19, with fares starting at $109 and maxing out at about $300 each way for departures from private-jet terminals. Customers can even earn points thanks to a frequent-flier partnership with JetBlue. JetSuiteX passengers can earn 250 TrueBlue points per segment on regular fares and 150 points for sale fares. JetSuite CEO Alex Wilcox, who was on the executive team that helped successfully launch JetBlue in 2000, is bullish on the prospects for the new JetSuiteX service. Wilcox says fares have been increasing on short-haul flights. Wilcox says that — coupled with increasing security headaches at major commercial airports — has created a sweet-spot in the market where JetSuiteX hopes to lure well-heeled, time-sensitive fliers looking for something between low-fare “cattle car” domestic flights and more expensive private jet options. “That’s created a space for this kind of product where we can charge a little bit more, but provide a lot more – especially in terms of time savings,” Wilcox says to Today in the Sky, pointing to the advantage of flying from private jet terminals. JetSuiteX’s inaugural route will operate within California, connecting Burbank’s Bob Hope Airport to Concord’s Buchanan Field, located about 30 miles east of downtown San Francisco. JetSuiteX says its initial schedule of up to two daily round-trip flights will give Concord its first scheduled passenger service since the early 1990s, when USAir discontinued the Concord service it inherited via its merger with Pacific Southwest Airlines. The next JetSuiteX route will begin April 22, with weekend-only service between Concord and Las Vegas. 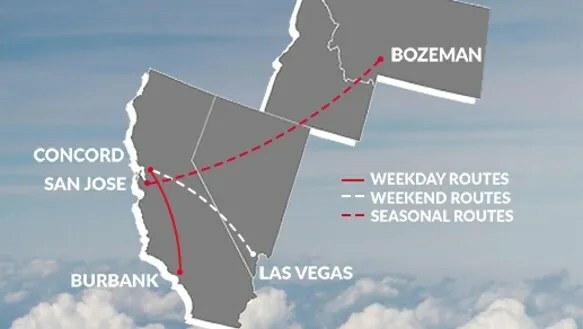 On June 30 JetSuiteX begins flying its third announced route, offering up four flights a week between Mineta San Jose International Airport and Bozeman, Mont. While JetSuite’s private-jet charters have so far been flown on smaller 4- and 6-seat aircraft, its JetSuiteX “public charter” service will be on newly acquired Embraer E135 regional jets. The company has 10 on order, all of which previously flew for American’sAmerican Eagle affiliate before being returned to Brazilian jetmaker Embraer. But Wilcox says customers won’t mistake JetSuiteX’s E135s for a planes flying typical domestic airline feeder flights. JetSuiteX has completely revamped the interior of the aircraft, configuring them with 30 seats. All have at least 36 inches of “seat pitch,” a standard industry measure of personal space. That, says JetSuiteX, is comparable to business class service on domestic carriers. Overhead bins have been removed to create a more spacious feel to the cabin. The cabin interior is also wrapped in a leather finish. Also onboard will be free in-flight Wi-Fi and in-flight entertainment that fliers can stream on their personal devices. JetSuiteX says new destinations will come online as more of its specially configured E135s are delivered. San Diego, Phoenix and Santa Barbara, Calif., are among cities JetSuiteX has singled out as possible expansion destinations. “There are a lot of markets that can support 30 seats that can’t support 160 (that are typical on bigger jets like a Boeing 737). We’re going to be creative in finding those,” Wilcox says. “We’ve only got 30 seats to fill. And we only have to sell 20 of them to (break even),” he adds. The company expects to have all 10 of its E135s flying by “mid 2017.” The aircraft also will be available for private charter services, selling for about $8,000 per hour for the 30-seat jet.